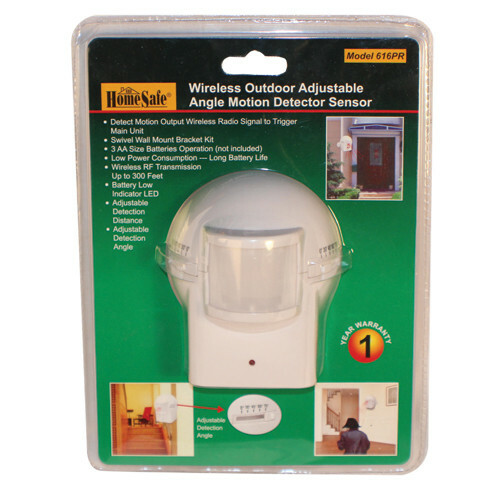 The OUTDOOR HOMESAFE WIRELESS HOME SECURITY MOTION SENSOR can detect motion from up to 30 feet away and has an adjustable 150 degree motion detection angle. It has a wireless radio frequency range of 300 feet. When triggered the RF signal activates the alarm. Easily protect every window and door of your home. Comes with wall mount and requires 3 AA batteries (not included). Works with the HA-SYSTEM, EWD-1, and HA-SIREN. *Cannot be used as a stand alone unit.